In the North lives a man, a giver of gifts, a Saint. He spends his days making toys and brooding over the airwaves, which bring in affirmations from around the world. Out there, they believe in him. So the songs say. But as he broods and makes toys, he has his doubts. Who knows if they exist at all, out beyond the endless snowstorms? Their faith has never been a problem, but he’s not sure he believes in them. Once a year, he rises, dons his red coat, and goes to find out. He brings the toys– just in case. Hello, friends! Sorry for the long absence – I’ve had my hands full with a lot of stuff for the last several weeks, and as a result, the poor blog got neglected. But I’m back, and for the next several days, I will be posting reams of Christmas-themed flash fiction to gear up for the holidays! Today’s piece was recently published on the Drabblecast Episode# 305, and now I’m happy to present it to you on my blog as well. I would highly recommend listening to the episode, because the production took the story to another level. One theme I love to explore in my writing is radical acts of faith in the face of the unknown, and this story is an example. 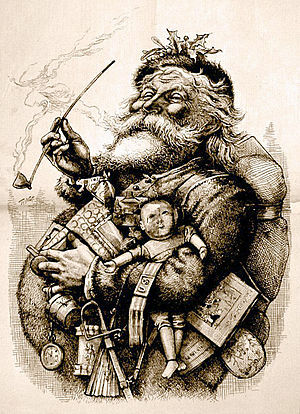 Santa is famously connected to the idea of belief. I’m reminded of The Polar Express, where those who believe in Santa can hear the bells of his sleigh, while those who have lost their faith can’t. In this story, the choice to believe in Santa shapes your external reality. Well, what if belief were a two-way street? What if Santa, in the isolation of the North, isn’t sure whether he is just making all of us up, because we’re equally wonderful and magical to him? I like to imagine that if we were to pick up where the end of this story leaves off, everyone involved would be pleasantly surprised. Santa would find the children waiting for him, after all. The children’s faith would be rewarded. A long hoped-for relationship, a source of deep longing, would finally come to pass. That’s the essence of faith, and the essence of Advent. Of course, it could all go the other way. Santa might find nothing but endless snowstorms. But I think there’s still something to grabbing that bag of toys, going outside, and taking a look.